convenience, speed and real benefits versus cash and credit cards. Why would the vending industry be any different? Most anything you read about generation X, Y, and Z confirm the fact that they embrace technology, convenience and speed on automated vending. A vending machine is a machine which dispenses items such as food, snacks, beverages, alcohol, cigarettes, lottery tickets, cologne, consumer products, and even gold and gems to customers automatically, after the customer inserts currency or credit into the machine. The vending industry is a 40 billion $ industry, below are just some of the many machines actively in use. These current figures don’t even cover the many machines vending non-traditional items in public places, worksites, government facilities, department stores, marketing and promotional companies the list is endless. The future of vending is strong and diversified especially when added to Carts Blanche LLC’s Mobile Trailer it is limitless. Everywhere you turn these days you’ll walk into a vending machine in one form or another. The traditional soda and candy machines along with cigarette and newspaper dispensers, have been joined by a new breed of machines hawking everything from movie rentals all the way up to iPods. These new-fangled machines are a cool addition to an invention that has been around for a long time, but you may actually be surprised just how long. It wasn’t until the 1880’s that vending machines made their first appearance stateside. The Thomas Adams Company manufactured the Tutti-Frutti gum vending machines and placed them in a bunch of New York trains stations, to great success. By 1905, the US Postal Service was using vending machines to sell stamps, and from there the craze really took off. The cigarette and candy machines were in place by the 1930’s, and by the time World War II rolled around, vending machines were raking in $600 million, an astronomical amount considering that most of the candy in the machines sold for a penny. Once the war was over, a manufacturing boom took place in the US, and that led to a large number of factories opening up. These new manufacturers were cranking out their goods 24/7, and in an attempt to help keep their workers fresh and wake, they installed coffee machines in their plants. Before long, vending machines with canned sodas and chocolate snacks were sitting alongside the caffeine dispensers. Today, the vending industry hauls in around $40 billion dollars annually, and is a business that seems to thrive no matter how bad the economy gets. It’s because of that success that many people now look at vending machines as a solid business opportunity. Just about anything can be popped inside those glitzy glass cases, and folks just can’t seem to resist the goods on display. We may have come a long way since the days of vending machines guarded by poisonous snakes, but given the advancements made over the years, we can only guess at what they will be selling inside them next. What does Seeds of Change do for local communities? Earlier this spring Seeds of Change promoted “Pledge to Plant” campaign by offering free seeds through vending machines. If you stop by the Seeds of Change you can Tweet your Pledge to Plant using the hashtag #PledgeToPlant and a unique code that the machine will give you. The vending machine will then automatically dispense a bag of our Certified Organic seeds and a coupon for our food products. If you can’t make it to the farmers market, you can just tweet @SeedsOfChange with the hashtag, #PledgeToPlant and you are automatically entered to win one of many home garden packages to help get your own garden started. Seeds of Change® is a Certified Organic seed and food company. They are passionate about connecting people to their food sources, so offer both heirloom and traditional seeds for the garden, as well as premium Ready-to-Heat Rice varieties, an assortment of Rice & Grain blends and selection of savory Indian Simmer Sauces. They demonstrate their commitment, by contributing 1% of our net sales toward sustainable organic farming agriculture. All of this is to celebrate Seeds of Change® Grant Program. This year, they’re distributed $190,000 in grants, which amounts to two $20,000 grants and 15 $10,000 grants. Seeds of Change® Facebook page or on their website. It is a “normal” vending machine clothing and sports equipment Nike involving a single form of payment, ilNikeFuel, fuel points that can be earned on special bracelet Nike in amounts proportional to the time spent on sports activities. The bracelet, on sale in the Nike Store, serves as a rechargeable card and ‘access to the products displayed in the vending machine, each one a number of valid points. The higher the value of the product, the more points are needed to receive and, consequently, the greater the time to devote to the sport. 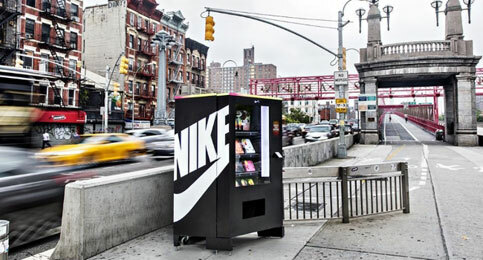 The peculiarity of the NikeFuelBox – this is the name of the vending machine – is that it has a permanent establishment, but is moved continuously so that New Yorkers are forced to walk long distances to find it by following the coordinates and clues that Nike is launching with his tweet. We believe that most athletes are all insiders to the movement of the machine daily! VendaWorks offers construction companies, workforce lodging companies and industrial caterers a new way to serve food and convenience store products to the workers at building sites, pipe line locations or any remote location. for vending machines and kiosk can save you $$$ and headaches. about your power source and how it can affect your technology on board. Power – How it can affect your payment systems. It’s easy… Just plug it in to an outlet and it works. Electricity, or power, has many obvious benefits to our industry. It keeps the soft drinks cold and the coffee or tea hot. It lights the machine to attract consumers and provides the convenience of quenching your thirst or shooing away that afternoon hunger.Power is just as vital for the operation of your payment systems, as well. Many things regarding power can impact the performance of payment systems. So we should all follow a few basic rules when installing the vending machine and the payment systems.First, know the minimum power requirements of your vending machine. Many machines have refrigeration, heating systems, motors, sensors, lights, etc., etc. And that’s without the payment systems. One basic rule of thumb is to have your vending machine plugged into a dedicated line or socket. Doing this will almost always ensure that the power supply, during peak operating times, will not affect the performance of the machine.Second, if the machine is located in an industrial area where high electrical noise or interference could be a problem, you should consider using some type of surge protector/electrical noise filter. By looking after the power requirements of your machine, you greatly reduce the potential of power causing problems with the payment systems. Now for the payment systems. Connections: Make sure connections are correct and secure. A few things to check are to visibly inspect the connectors. If a pin or wire is loose, it could make the connection intermittent. If there is a locking tab on the connector, use it, make sure it is not damaged and inspect that it is secure. Cables: Inspect all cables for damaged insulation, exposed wires, and if it will rub or interfere with any mechanical operation of the vendor. Cable Ties: Always have many on hand. You should use these to secure cables in the machine. This minimizes cable interference with mechanical systems and reduces the chance of cable damage when opening and closing the doors of the machine. We are reminded to never disconnect or connect payment systems while the machine is powered on. This practice puts great stress on the vending machine controller’s (VMC) power supply. Over time the VMC can be damaged when payment systems are hot plugged. This is because with each hot plug, the stress on the power supply can be accumulative and slowly damage components on the VMC. But, in addition to the VMC, many payments systems can be damaged as well. That’s an additional concern for operators and technicians. Some machines have power switches and some don’t. If you don’t have a power switch in your machine, you must get creative. Sometimes you can access the main wall plug, so that could be an option. Or you can access a fuse or connector that will disconnect power to the VMC. If you are not sure, contact the vendor manufacture or literature for your options. The good news on this topic is that all current CPI payment devices are protected against hot plugging through their design. So if the mistake is made, you can rest assured that the CPI Coin Changer, Bill Validator or Cashless System (telemeter and bezel**) will not be damaged. But… let’s all be safe and power down the machine before making or breaking connections. **Given the sensitivity and complexity of the cashless system, hot plug capability is especially advantageous in that it protects these expensive assets and any mix-ups with installation. (PRWeb.com via COMTEX) — The mobility of VendaCarts automated food trailers facilitates relief efforts with a rapid deployment and relocation, transporting food to disaster survivors and work forces. VendaCarts operates in the recovery phase by delivering short and long-term food services to people in disaster areas and at reconstruction and building sites. The VendaCarts business model speeds up the delivery of vendible food and non food items, serving large numbers of people in a shorter time frame by providing nine individual self-serve lines serving meals to up to 250 people within 30 minutes while being operated by a single person. “Carts Blanche, LLC designs innovative, actionable emergency food service trailers that solves challenges and make a difference in disaster relief areas”, says Annette Nolan CEO. “We work with individuals and companies globally to provide the most complete automated food service trailers available”. Carts Blanche, LLC, based in Mobile, Alabama is the designer and manufacturer of VendaCarts,a revolutionary mobile automated trailer equipped with up to nine built-in automatic vending machines plus a combination of service units such as ATM’s, digital signage boards, microwaves and change machines. Once on location, both sides of the trailer pneumatically raise creating awnings that expose the ready to operate vending business. The trailer design allows daily business activities to be accomplished by one person. VendaCarts combines the fast-turn, high-volume worlds of vending and concessions with mobile real estate allowing the owner to capitalize on new markets and new customers at a higher rate of return offering a fresh new approach to self -service retailing. Carts Blanche is the global leader in mobile robotic retail. Our “VendaCarts” products provide a self-contained, self-service solution for retailers while delivering customers unlimited versatility in retail and convenience. VendaCarts mobile automated kiosks are a new and unique way to deliver traditional and non-traditional retail products to the masses where they shop creating a time-efficient option instead of waiting in long lines. VendaCarts is designed to deliver 24/7 self-service consumer purchasing at thousands of non-traditional locations while offering unlimited versatility and retail convenience at: disaster relief, pipe lines, construction sites, remote locations, universities, military installations, sportsplex and specialty events or at any outdoor locations. VendaCarts serves the masses through individual self-serve lines at a speed faster than traditional catering trailers or food trucks. The largest trailers can service nine lines and can be equipped with eight microwaves serving three meals daily to hundreds of employees with time constraints. VendaWorks offers construction companies, work force lodging companies and industrial caterers a new way to serve food and convenience store products to the workers at building sites, pipe line locations or any remote location. VendaMarts rolling convenience stores (C-store) extend market for automated retail sales. These mobile mini markets deliver traditional and nontraditional products to customers in remote locations where they work, go to school and have fun. These mobile stores operate 24/7 while web based – online management systems track inventory and produce reports in real time. The automated machines accept cash, credit/debit cards and custom card programs. VendaCarts has additional storage over the wheel well area that can accommodate microwaves, ATM, change machines, condiment stands or a combination of these items in lieu of storage space. The vending industry report for 2013 -14 reports that, among operators, there is a larger than expected interest in screens on vending kiosk. Many operators are impressed by the “wow” factor, and think that they want to add screens to their machines, but they don’t know all of the benefits that the new technology can deliver. This webinar will provide that information. Utilize a flexible technology interface that can grow as operators want to add new features/services like couponing. Students do not mind buying healthier snacks from vending kiosk, according to research published in the International Journal of Food Safety, Nutrition and Public Health. Researchers at Ithaca College carried out an experiment on two campus vending machines in which they swapped out high sugar, salt and fat snacks for healthier options and then surveyed 200 students on their satisfaction and perceptions regarding the snacking options. No promotions or incentives were used to entice students to purchase the healthier options and the foods sold were not labeled as healthier. The key finding was that sales from the vending machines did not decline when healthier options were added. Moreover, when made aware of the changes, students said they were happy to have purchased those options and the more athletic among them felt it was a positive change. “Results offer insights for promoting healthier choices and suggest that improving the healthiness of vending machine selections can serve all stakeholders: consumers, companies and institutions,” the researchers concluded. The study compared college students’ perceptions and self-reported behavior regarding the food in vending machines before and after replacing a portion of the conventional food items with healthier foods, defined as having fewer calories (less than 400 calories for snacks and cereals, and less than 150 calories for candies); limited added sugar (less than 5g. ); lower fat (less than 3g. per serving), healthier fats, no trans fats, no artificial colors or flavors, and lower sodium (less than 140mg. per serving).